Cry Havoc And Let Slip The Dogs Of... Metal Gear?! 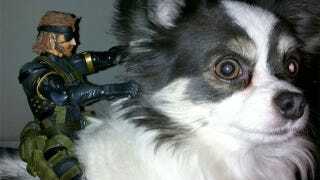 Tonight's open thread is brought to you by Kotaku reader John's girlfriend, a Big Boss action figure and Toby the dog. Photos like this are one of the benefits of having a tips line at Kotaku. John explains how this photo op came to be. "I woke up this morning with these photos in my inbox, courtesy of my girlfriend," he e-mailed. "I like to think that if Snake had to ride into the gates of hell, he would choose my dog to get the job done." Seems perfectly logical to us, especially with the accompanying photo of Toby on fire. PhotoShopped on fire, I mean. Kotaku readers, including you, John, thanks for making today fun. Let's end it with some off topic conversation, perhaps about these things. Google CEO Eric Schmidt steps down - Larry Page takin' over. Above Everything Else - A beautiful little CGI film. I'd seen stills before, but not in motion. Super Bowls ads include trailers for Captain America, JJ Abrams' Super 8 - There will be a football game too! Go Steelers! Oh, those compact fluorescent light bulbs aren't so great? - Bummer, but not surprising since I've had a few last months, not years. Google to launch Groupon competitor - Google Offers seems like a product too late.